Below: I placed this knife here in the "standard P-2 page although it is anything but standard. The handle is a finely turned and coarsely knurled aluminum! I have never seen one before. In mint condition, with a sheath that reminds me some of the Randall Made Knives sheath and 3rd pattern sold during the Vietnam war. "B2" is stamped on the guard and that is the only marking. There is no England stamp. One can only wonder at where a knife like this originally came from. The heavy blade has a deep french blue finish. Below: A pretty standard Wilkinson P-2. Someone at sometime decided to grind off most of the top nut. Who knows why, but it does streamline the pommel. 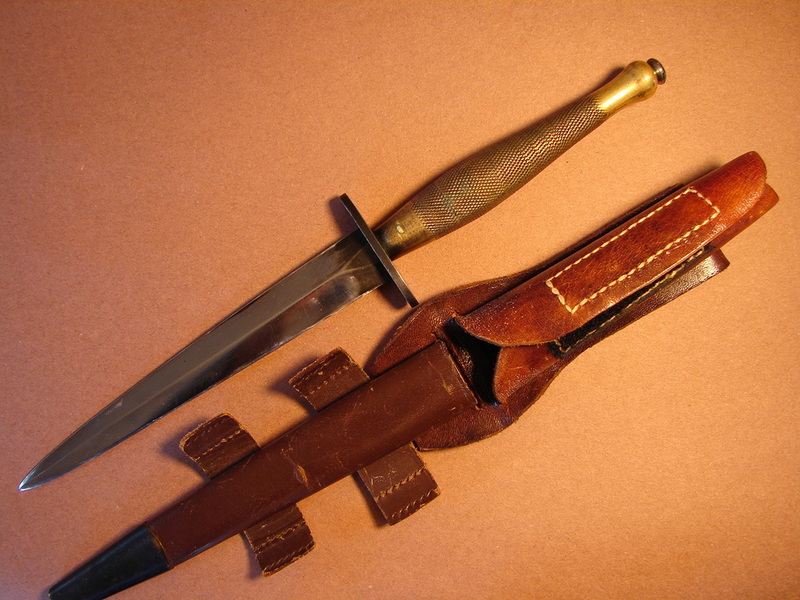 The knife is tight and came with its original sheath. I have never seen a second pattern I did not like. 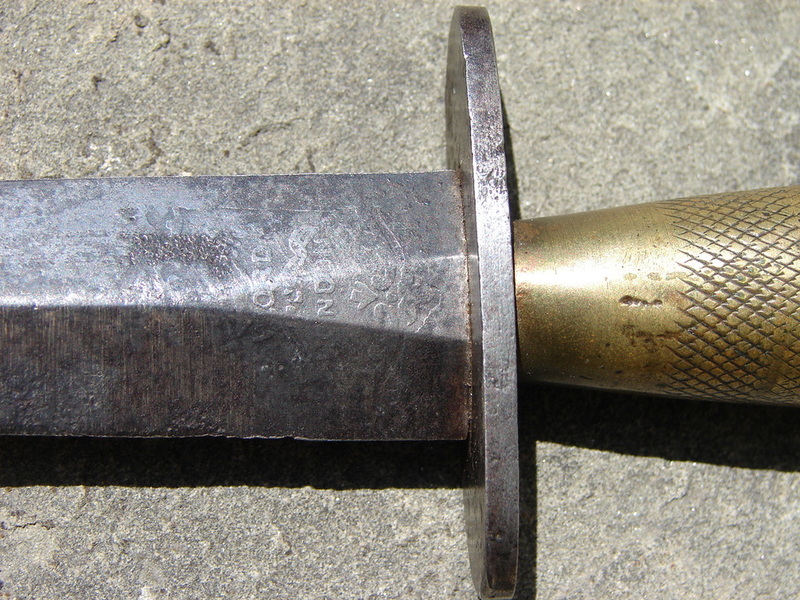 Below: This knife is both rare and in some ways a standard issue Second Pattern. It was made by J. Clarke and Sons, Sheffield, in 1942. Or at least that's how the guard is stamped. The guard by the way was badly bent when i bought it. I suspect the damage was incurred by someone throwing the knife. The last bit of the blade tip was also missing. Based on the old rust present it was reshaped many years ago, probably during the war. I took the knife out to my workshop and gently bent the guard back as straight as i could without actually disassembling the knife. The handle is stamped with the broad arrow and "9". As with other J. Clarke & Sons knives the handle has reverse knurling. Unlike my others though, the handle is not silver plated. There are a few other less obvious identifying characteristics, which are discussed in my forthcoming book. Below: This knife was reputedly issued to an O.S.S. Agent when he arrived in England. There are no marks on the knife. 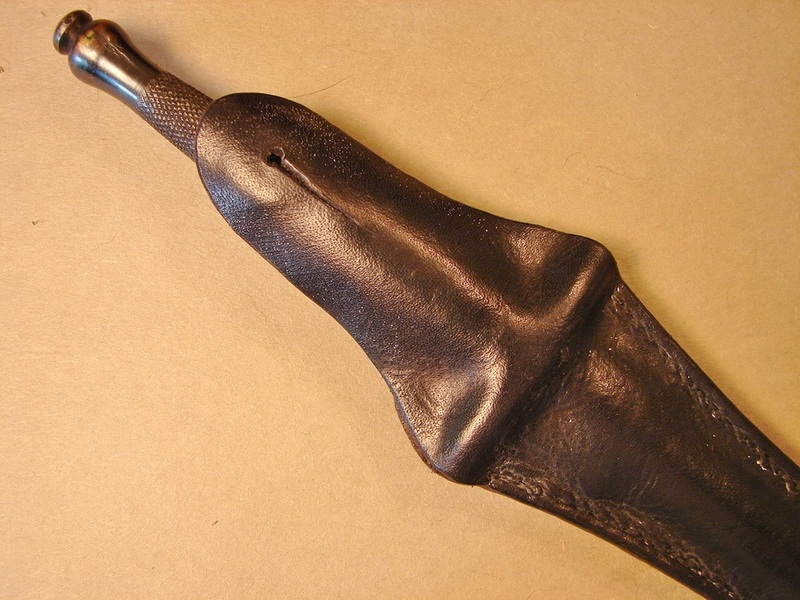 The sheath is not original to it. It has a heavy blade in mint condition. The handle is unusual with large pockets of porosity in the other side near the guard. The handle is vaguely shaped like a button hilt but not quite. The guard is also unusual, made of German silver and the slot on the handle side is wider than on the blade side leaving the cuts exposed on each side of the handle. The knife has not been apart and is tight. I am almost tempted to place it in the category of Indian-made except the veteran specifically said he got it in England and the handle does have a top nut, and is not soldered in place. Below: A real war horse! I have owned this knife since 1993 and it is a nice specimen of a well used knife. The Wilkinson logos are almost worn away and I don't think the original seller knew it was a Wilkinson. I got it for $140 and although a little tired it is still a nice tight knife. The extra long bevels on the blade where it enters the guard are uncommon. 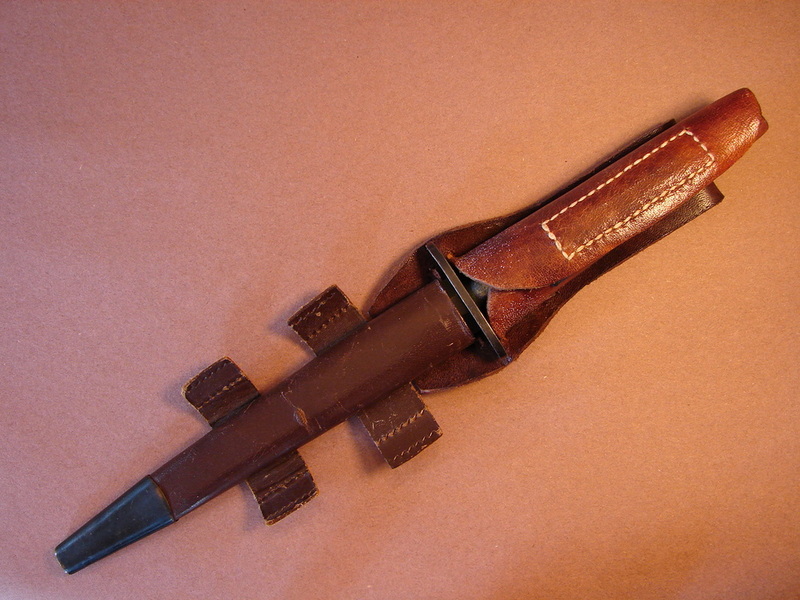 WW-II style medical tape holds the worn sheath together. It most likely belonged to an American soldier, based on the wire hanger on the frog. This would allow it to be attached to an American style web belt. The slit in the frog was used to hang the sheath from a suspender button.I have changed my thoughts on the slit in the frog. 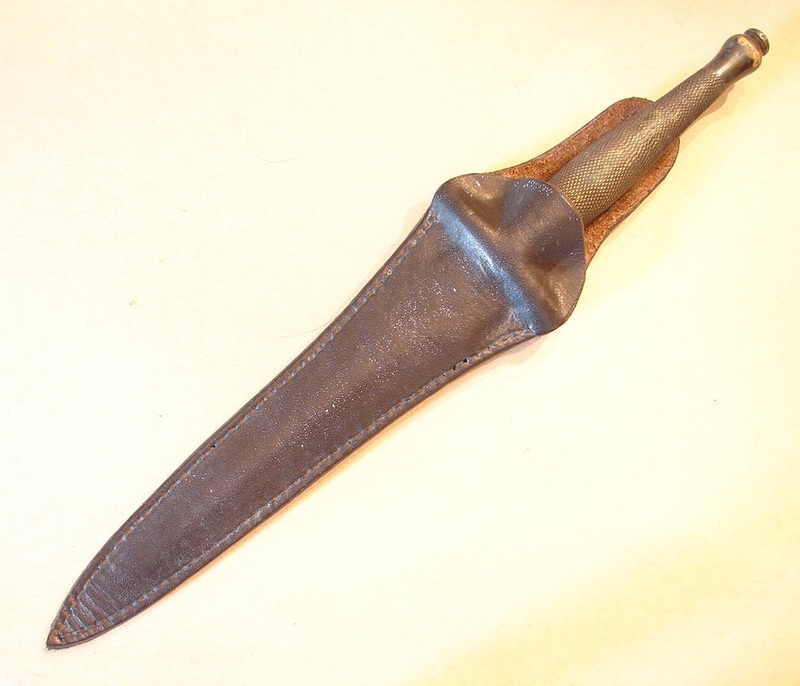 Some men cut a slit like this and folded the top of the sheath over and forced it down over the pommel as a means of retention. Makes sense considering how fragile the elastic keeper was. Below: As you can see, sometimes you have to look very close to find the etchings. They were very shallow and could be easily worn away. Second Pattern X-Dagger? 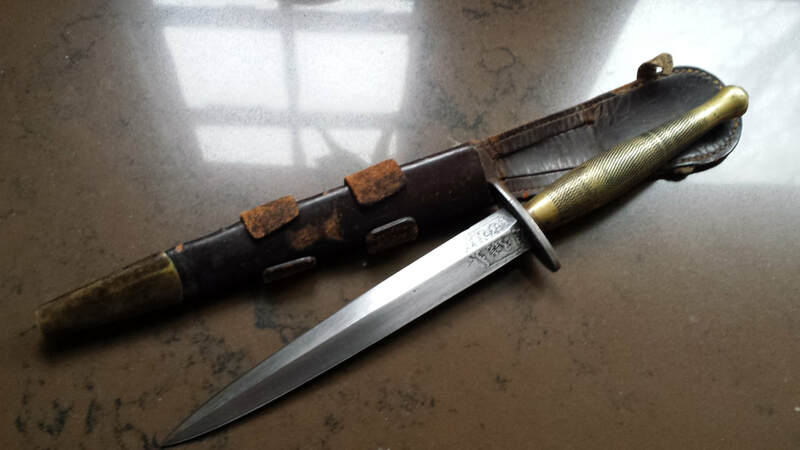 This interesting knife came to us from Roy Shadbolt. What makes it unusual? Several things. 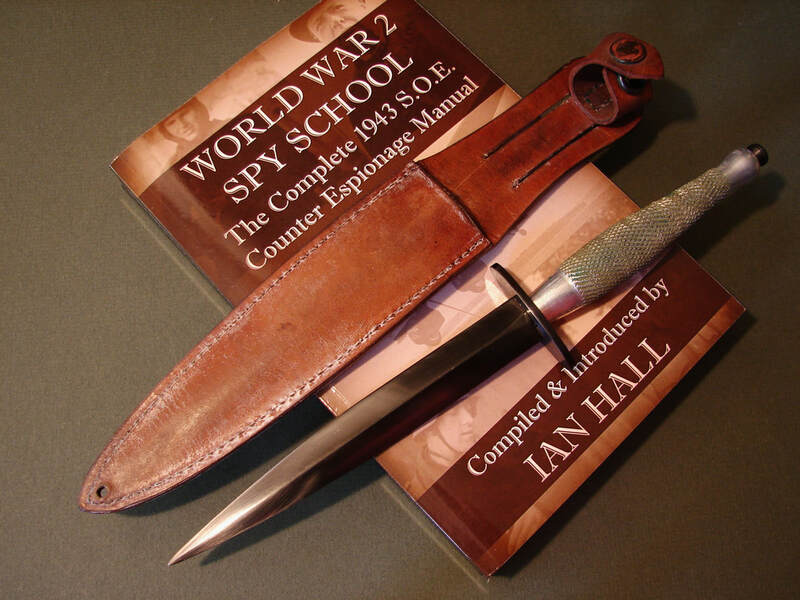 Obviously the sheath which is of a style normally associated with those pesky X-Daggers and Camp X knives. Close examination of the sheath shows us two things, One, it was molded to fit a First Pattern Knife with a square ricasso and straight guard. (This is not the knife this sheath was originally made for.) Peering down the throat of the sheath I can clearly see the square corners indicating a tablet style ricasso. Outside, you can barely see the corners of the same. Also of interest is the button hole frog. In the close-up photo you can see the impression left from a suspender button adding validity to that form of inside the waist carry often read about and sometimes disparaged by the experts as poppycock. Based on the quality, fit and finish this is undoubtedly a Wilkinson knife, maybe. The blade is heavier than a std. Wilkinson. The knife's condition is near mint with a nicely polished blade and almost all of the handle and guard finish intact. The top nut is correctly peened and never messed with. What is of more interest is the cross-guard is only stamped with a very crisp "X". This is the only marking on the entire knife. There is no broad arrow, "England", etc anywhere. The "X" was definitely made with a stamp (not an engraver of any type). Having seen a few others, Roy believes this one to be genuine. 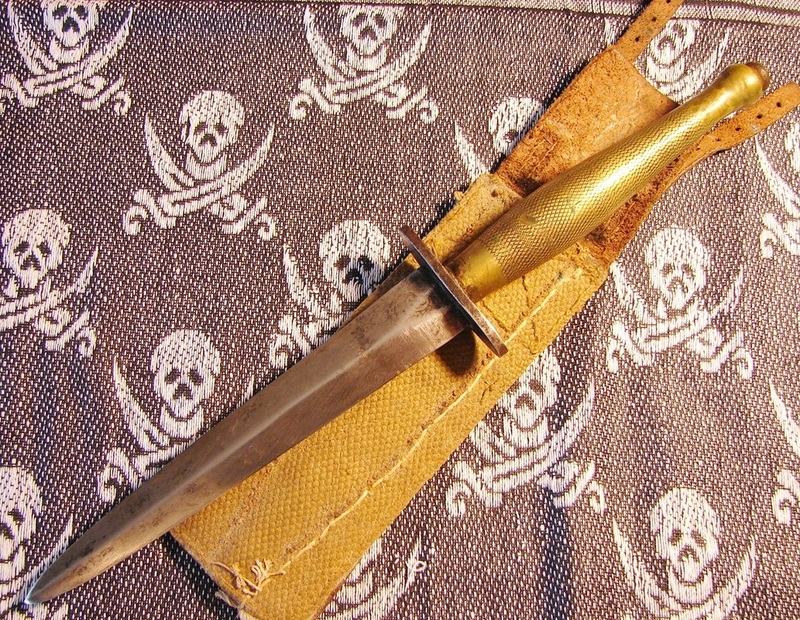 This "X" is very similar to the one on the mini-dagger made from a 1903 bayonet in the section on Agent's Daggers (shown here at the right). But then an "X" is just an X, isn't it. It meant something to someone, though we'll probably never know what. New material I was given says that an "X" without serifs is one of the marks used by John Paisley. Could be, or may not be, his work. Looks like a Wilkinson to me. Or was it issued to a member of X-Troop? 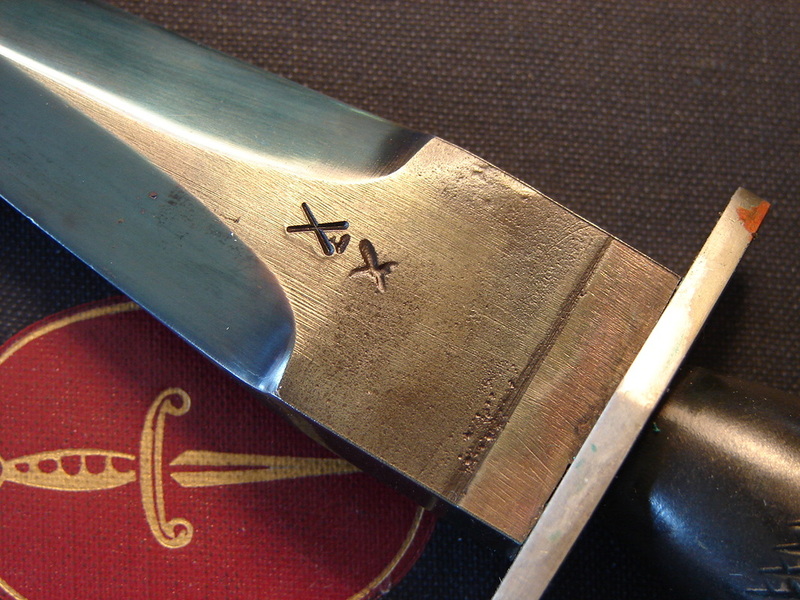 Button Hilt Knives: The blade of this example is clearly etched with the Wilkinson Sword logo, although I have seen others without any etching. Very little else seems to be known about this variant of the Second Pattern knives. As with many of my knives this one came from a source in Canada. 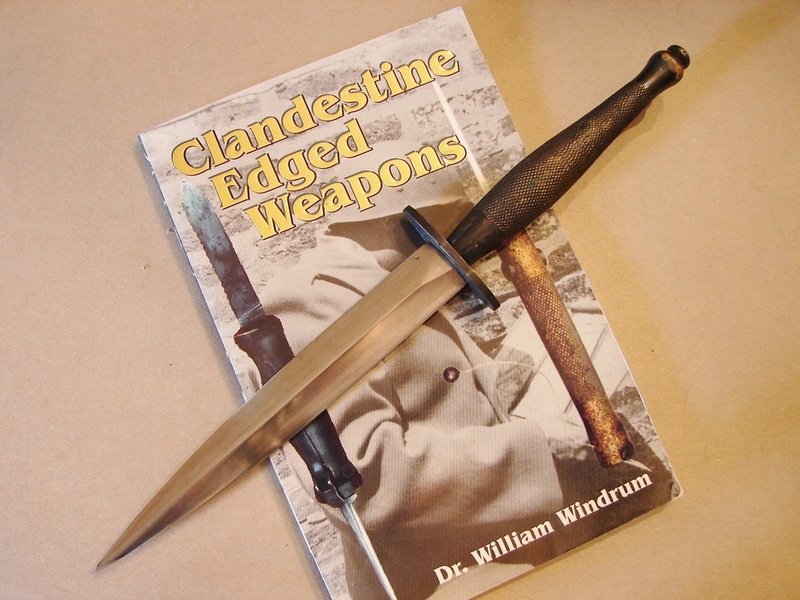 The distinguishing factor is the small, flattened "button" pommel which is less bulbous than the one on standard knives. One other difference is that the handle rises to more of a peak mid-center and then rapidly tapers off as compared to the normal Coke Bottle shape. 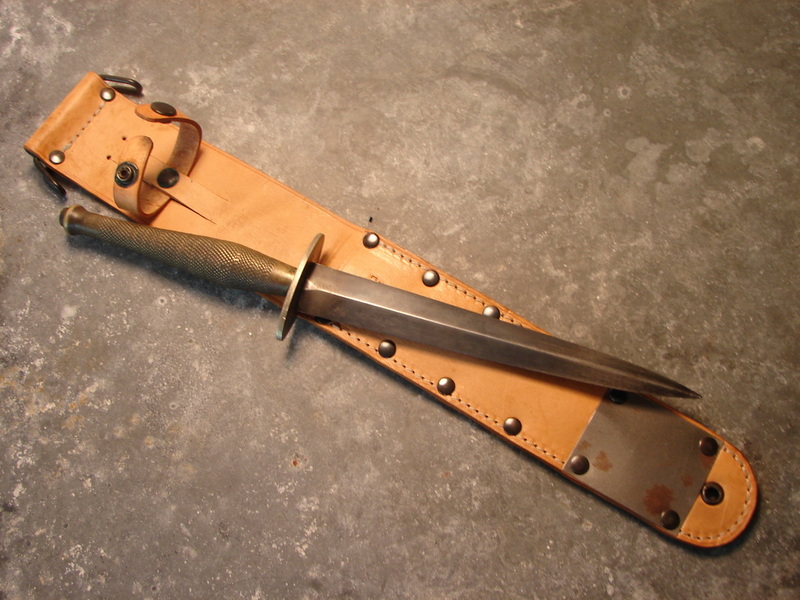 The overall handle shape is similar to the steel hilted "French Resistance-Maquis" knives. Over the years I have seen no more than three or four knives of this style. 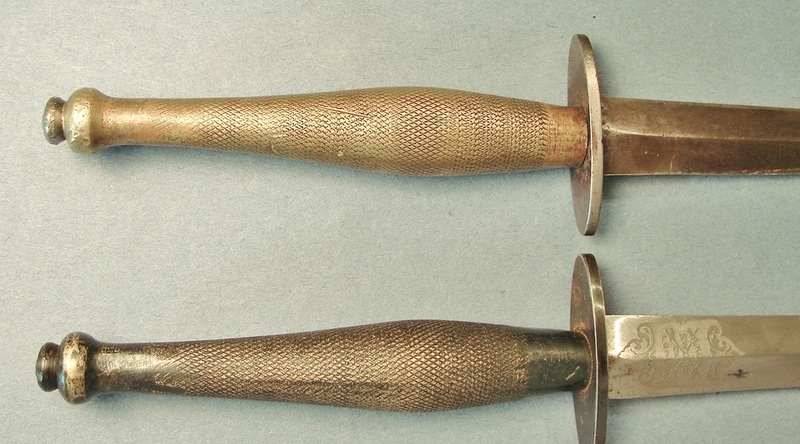 Below: More photos of a couple Wilkinson button-hilt knives. You can see the difference between the two handle pommels. Some people have said it was simply a deviation caused by machining. Others say it was a series of bad castings that "slipped through." To me it looks like a totally different casting pattern. If you look closely you will see the mold parting mark/flashing (handle on right) extends all the way to the pommel so it is not a handle that was over machined. 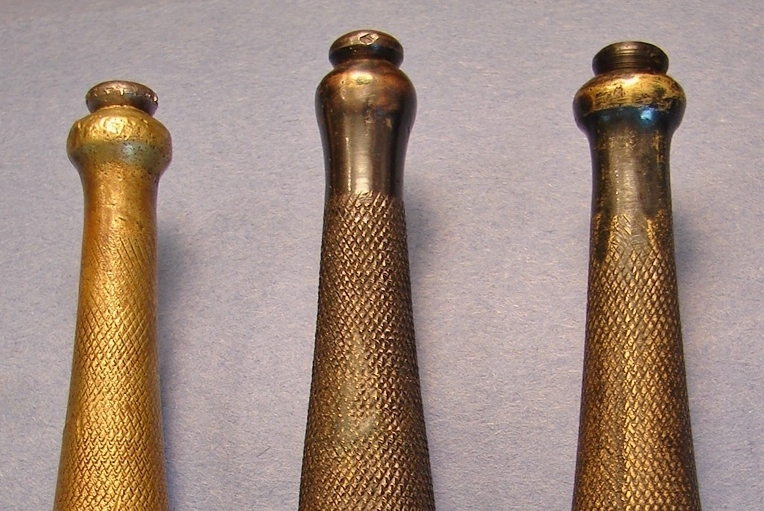 Below: Standard hilt in the middle between two button hilt knives. 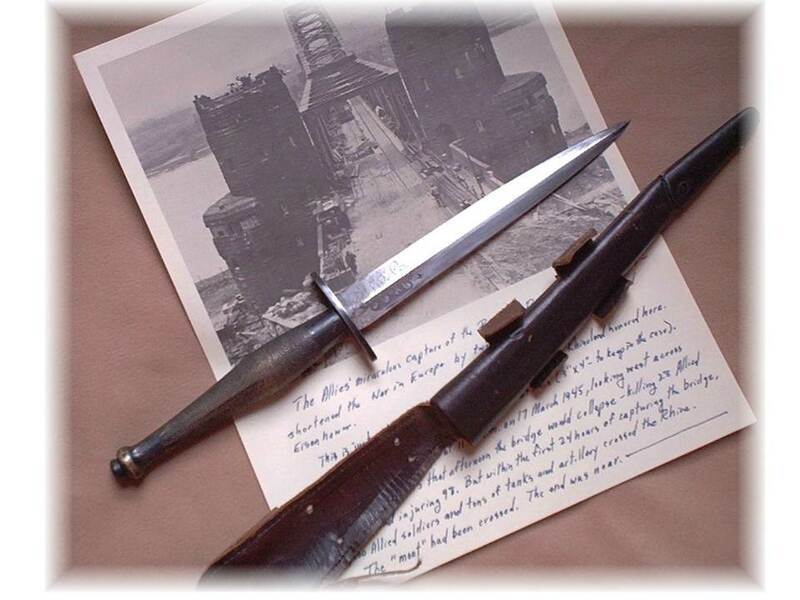 Below: These are both Wilkinson Sword marked knives. 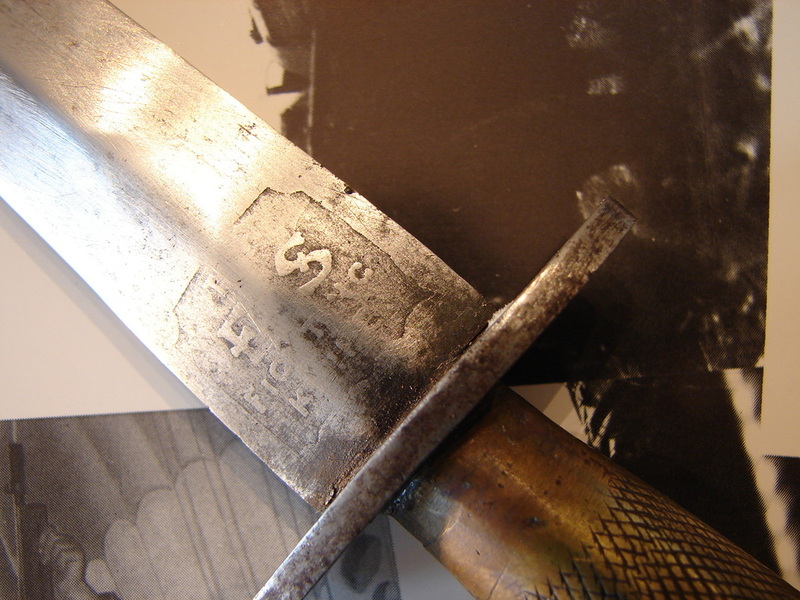 The top one has the Wilkinson logo worn away but the F-S Fighting knife logo barely intact on the opposite side. They are both button-hilted knives. This knife is a fine example of a Second Pattern, B2. 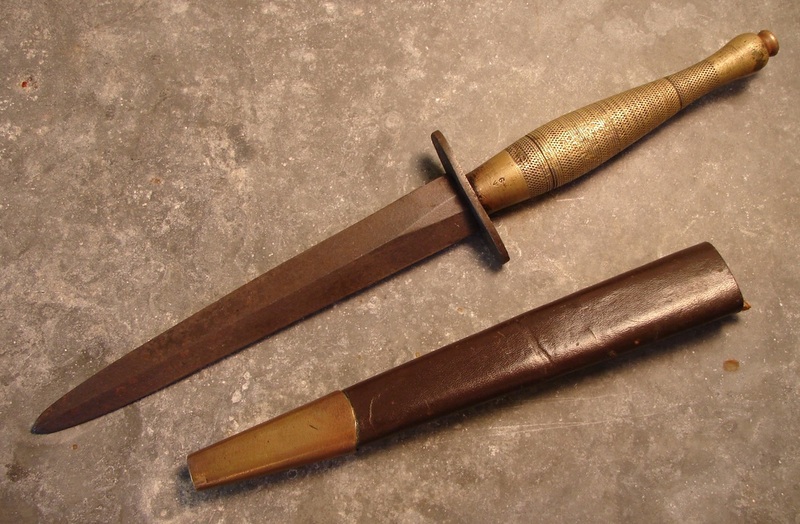 There are no other markings on this knife except the small “England” stamped on the guard, a customs’ requirement for its eventual importation into the US, and the “crow’s foot” or broad arrow acceptance stamp of the British War Dept. Once it was thought (due the their exceptional quality) that the B2 versions were produced by Wilkinson Sword Co. Now some say the B2 code indicates manufacture by BSA, or Birmingham Small Arms, or that it is only an individual inspector’s stamp. Note: Now the experts are saying the B-2 was NOT made by BSA but "most likely by Wilkinson." You start to see what I mean about the fragility of proof and the fallibility of experts. The man who sold it to me said that it had been last carried in the late 1960s by a British soldier during the “Troubles” in Northern Ireland. I have no way of proving or disproving his story, nor do I feel a need to, the knife speaks for itself. It is still a battle worthy knife today. finely checkered bass handle too. Again, this indicates a lot of handling and honest wear. Some collectors would not even take a second look at a knife like this. To me they are the ones with a legitimate heritage not content to stay safely tucked away in some foot-locker. It has led a rough life and shows an incredible amount of wear. The F~S and Wilkinson logos are nearly erased by polishing and sharpening. It came with this field expedient sheath which barely fits its shortened blade. The knife is still tight and serviceable. 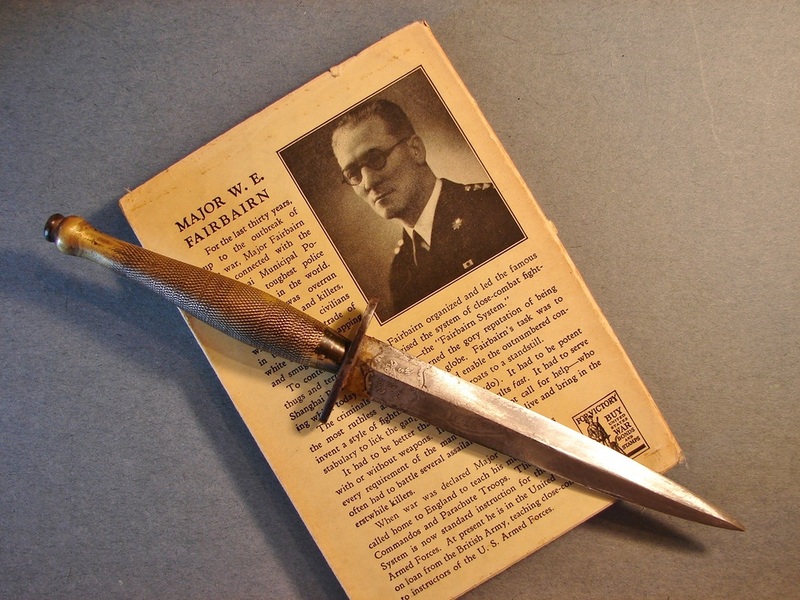 I am sure some soldier carried this honest to God Wilkinson Sword fighting knife with great pride. 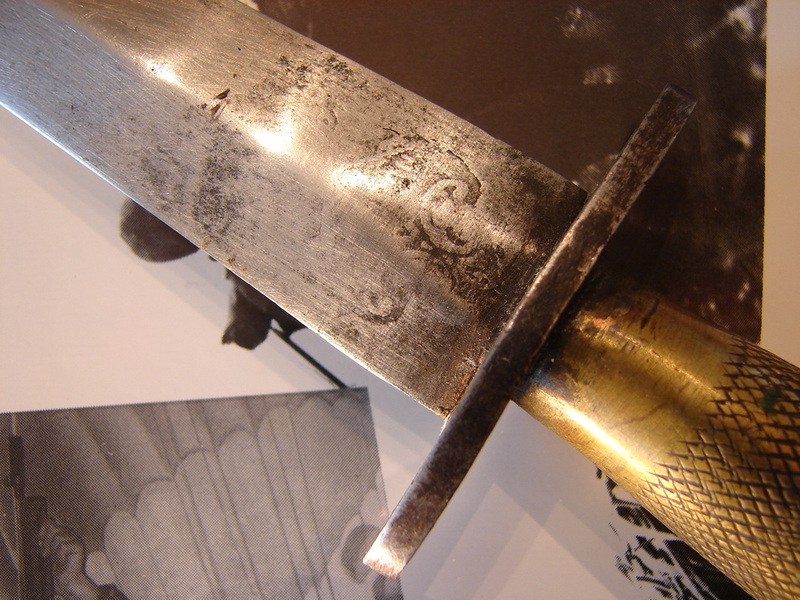 You have to look closely to see any remaining etching on the blade. The seller did not even notice it was a Wilkinson! 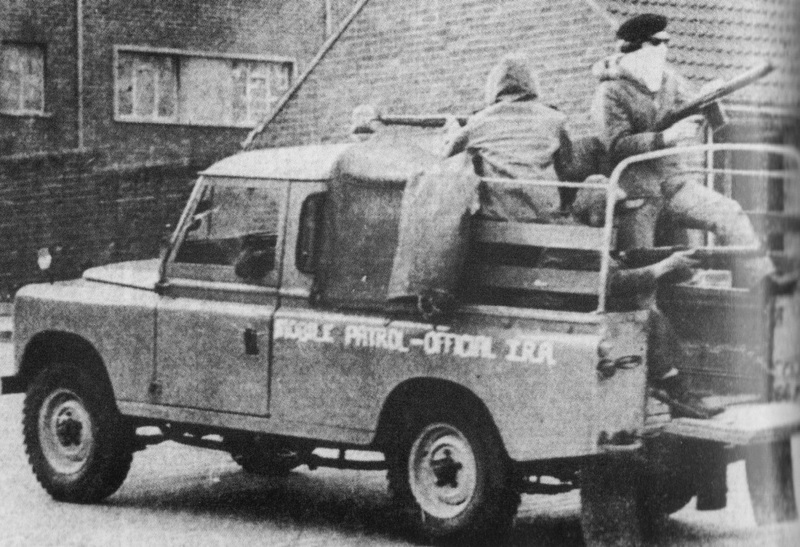 The above photo is from the website "The troubles in Northern Ireland." 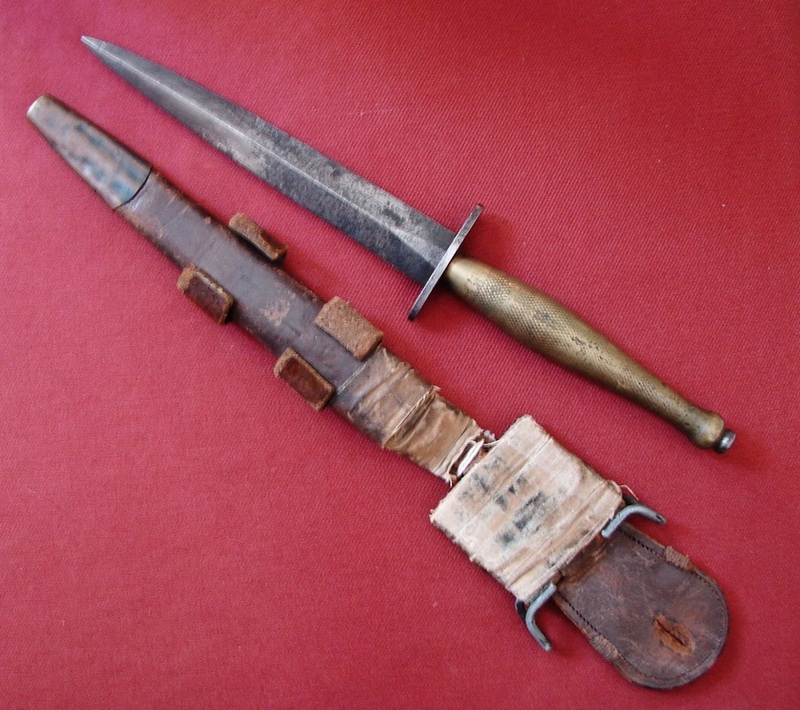 Below: You do not find WW-II sheaths (or knives) in much better condition than this one. 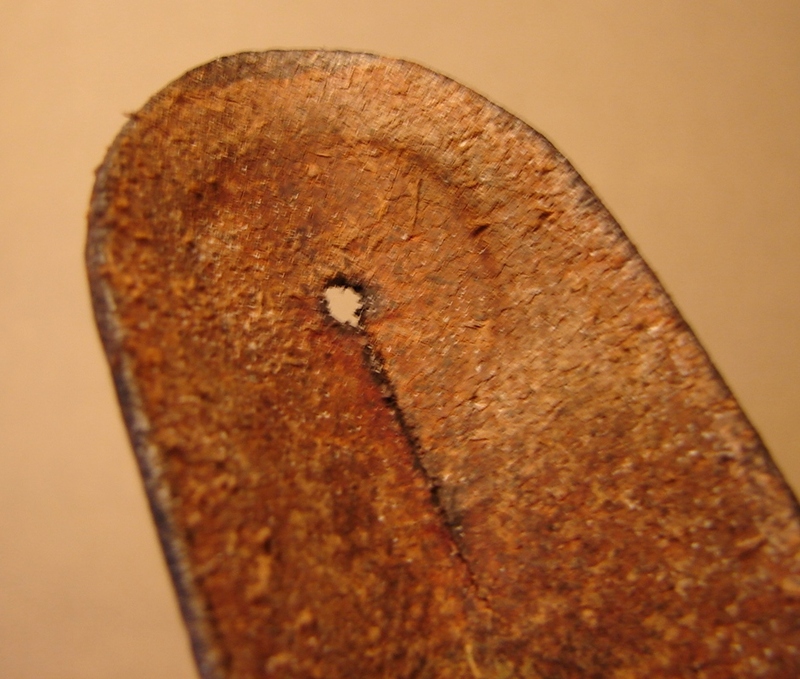 It has the rivet on the front side of the chape, tabs still intact, and missing only the narrow brown elastic. There is some light rust on the blued chape. Above: Second Pattern B-2 (NOTE: Robert Wilkinson-Latham now has determined that B-2 knives were made by WSC, not BSA.) Some previous owner tried to use a Dremel or other electric tool to sharpen this knife and left faint swirl marks on the blade. Then someone went over it with a cold blue solution to try to cover them up. Idiots abound. A bit of the original blue remains just below the guard. The dilemma is always whether to clean up the blade by careful polishing or to leave it alone. When in doubt, my advice is, do not mess with it. Note the ubiquitous broad-arrow and England stamping on the guard. 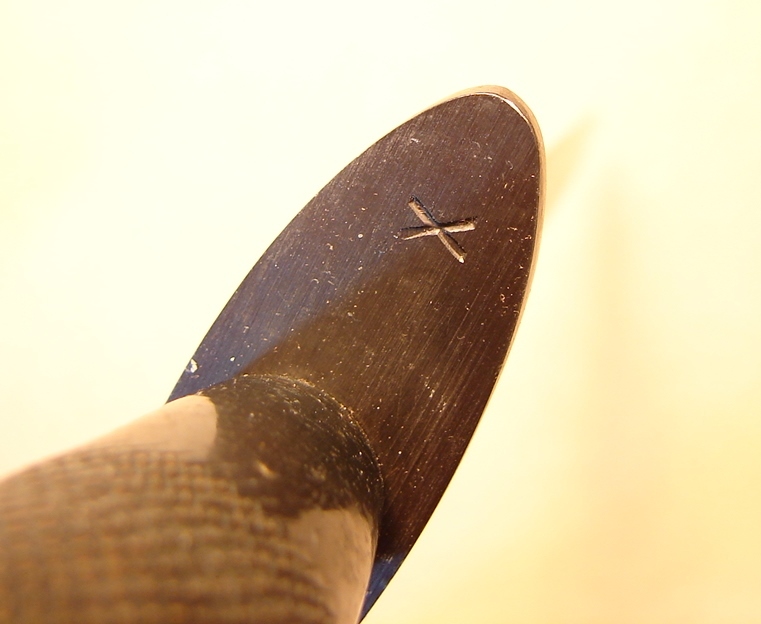 A very close look reveals a partial "B" stamping indicating this is a B-2 knife. you can see how the "B2" is almost indiscernible. This is not uncommon and often leads people to assume they have a knife with a rare stamp, when in actuality it is an incomplete stamp.